Coal bed methane is a natural gas located in coal seams, which is extracted without mining of coal. The coal seams may be mined in the future depending on geological conditions, technical and economic feasibility. Main sources of coal seams methane of Ukraine are located in Donetsk and Lviv-Volyn coal basins. Total forecast reserves of coal seams methane in Ukraine constitute to 12-13 trillions cubic meters, out of which 3-3,5 trillions cubic meters constitute to recoverable coal bed methane resources. Potential coal bed methane extraction is estimated at the level of 2-12 billions cubic meters per year. Potential cost of coal bed methane extraction, estimated by Baker Tilly, equals to UAH 2300-3300 per 1000 cubic meters. Coal bed methane extraction projects (upfront coal beds degassing) in Ukraine are at the experimental stage. As for 2010 nine hydrofracking operations in coal beds and accompanying formations were performed at Krasnoarmiyske and South-Donbass fields of Donbass. None of them resulted in commercial flow of methane. 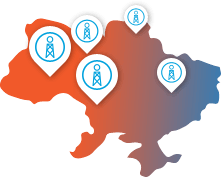 Exxon Mobil, Chevron, Gazprom, TNK-BP, EuroGas Ukraine, Total, Marathon Oil, Iskander Energy have all shown interest towards coal bed methane extraction projects in Ukraine in different times. In July 2010 Canadian 3P International Energy by acquiring Galizien Energy company has entered the coal bed methane extraction project, which has been being developed jointly with EuroGas Inc. Project foresaw drilling of 10 wells for coal bed methane. However, already in October 2011 3P International Energy has terminated the project to focus on traditional natural gas extraction activities. Iskander Energy owns 3 licenses for coal bed methane extraction at the area of 1 350 km2. South Donbass license is being developed in cooperation with Industrial Union Donbass (IUD). 4 pilot wells were drilled. Two new wells are planned to be drilled till the end of 2013. Krasnoarmeysk license is developed jointly with LLC “Carbona Energo”. First well drilled to total depth of 1,680 m, however has not produced commercial flow of natural gas. Krutoyarivska Licence is being developed in cooperation with LLC “Ecomethane” and IUD. In August 2013 it was reported that US company Epsilon is buying LLC “NPK-Contact”, which owns coal bed methane extraction licenses. According to Deputy General Director of PJSC “Mine named after A.F.Zasyadko” Borys Bokiy, coal bed methane is currently not extracted in Ukraine, but utilizing modern hydrofracking technologies could probably make industrial coal bed methane extraction a reality in the near future. PJSC “Mine named after A.F.Zasyadko” is the largest producer of coal mine methane extracted during mines degassation (CMM). In 2010 Ukraine has produced 52,3 million cubic meters of coal mine methane. The largest producers include already mentioned Mine named after A.F.Zasyadko, Coal Company Pokrovs’ke from DonetskSteel group of companies and DTEK Mine Komosomolets Donbassa. Ukraine provides state support to coal seams gas extraction. In particular, profit from economic activities foreseeing extraction and utilization of coal seams gas (methane) is exempted from profit tax till 2020 according to the Law of Ukraine “On gas (methane) of coal seams“.